DATE OF PUBLICATION OF THE OFFICIAL VALID STANDARD: 21. 02. 2006. 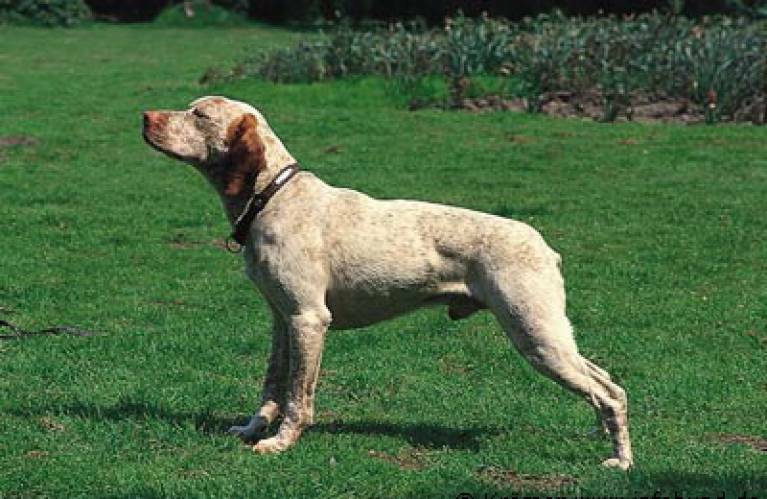 FCI-CLASSIFICATION: Group 7 Pointing Dogs Section 1.1 Continental Pointing Dogs,Type “Braque”. With working trial. BRIEF HISTORICAL SUMMARY: The Bourbonnais Pointing Dog was already known in 1598 (“Natural History”, Aldovrandi – National Library). The ancient authors described him as a pleasant companion of the hunter, of hardy and healthy appearance. His white coat is entirely covered with fine brown or fawn ticking. The breeders of the 1930’s wanted to impose a “faded lilac” coloured coat along with the obligation of being born with a naturally short tail. This strict selection put the existence of the breed in danger. In the 1970’s, a team of breeders decided to work for the survival of the Bourbonnais Pointing Dog. The present state of the breed allows us to be confident about the future of the breed. BEHAVIOUR/TEMPERAMENT: In the home he is kind and affectionate. When hunting, his passion and intelligence allow him to easily adapt to the most varied terrains and game. When searching, he naturally carries the head high to find the scent, proving his aptitude for useful and precise pointing. CRANIAL REGION: Skull: Round, seen from all sides. The lateral sides are rounded, the parietal bones and zygomatic arches well developed. The axes of the skull and the muzzle are parallel, or very slightly divergent towards the front. Stop: Moderately defined. FACIAL REGION: Nose: Broad, with well opened nostrils. It sometimes protrudes over the perpendicular line of the lips. Its colour matches that of the coat, without unpigmented patches. Muzzle: Strong and broad at its base, tapering slightly towards the tip to form a truncated cone. Not as broad in females. Bridge of the nose: Straight or slightly convex. Lips: Not too thick, the upper lip covers the lower lip without forming too much of a fold at the corners of the mouth; the edges of the lips are well pigmented. FCI-St. N°179 / 29.03.2006 4 Jaws/teeth: Strong and of equal length, with complete dentition, forming a scissor bite. A level bite is tolerated. Eyes: Large, more or less rounded, hazel or dark amber depending on the colour of the coat. The look is expressive, kind and intelligent. The eyerims are well pigmented. BODY: Topline: Straight and well sustained. The withers are well defined. Back: Solid and well muscled. Loin: Short, broad and muscled; well coupled to the back. Slightly longer in females. Croup: Rounded, moderately oblique, with powerful muscles. Chest: Wide, long and deep, reaching or extending slightly below the level of the elbow. The sternum reaches as far back as possible. Ribs well sprung. Underline: Progressively rising. The flank is flat and only slightly raised. General appearance : Seen as a whole: Very muscular. Seen from the front: Upright . lbows: Fitting close to the body but not too tightly; neither turned in nor out. Forearm: Straight and muscled, with strong bone without appearing coarse. Carpus (wrist): Strong. Metacarpus (pastern): Sloping very slightly in comparison to the forearm. General appearance : Seen as a whole: Strong bone with a very apparent musculature. Seen from behind: upright and parallel. Stifle: Strong, with good angulation between upper and lower thigh. Lower thigh: Muscled, practically as long as the upper thigh. GAIT/MOVEMENT: Strides of average reach. When hunting, the gait is a sustained gallop, balanced and supple. COAT: HAIR: Fine, dense and short; a little coarser, and sometimes longer, on the back. On the head and ears, the hair must be finer and shorter. • Overshot or undershot, with lack of contact between incisors. • Incisor arcade deviated. Click Here to Learn about breeder background checks on Braque du Bourbannais breeders if you are looking for Braque du Bourbannais puppies for sale. Click Here to learn how ResearchBreeder.com can help you find healthy Braque du Bourbannais puppies for sale. Click Here to order a Breeder or Kennel Background Check on Braque du Bourbannais Breeders that may have Braque du Bourbannais puppies for sale. Click here to find the national breed club for Braque du Bourbannais puppies for sale. Click Here to purchase a list of approved ResearchBreeder.com Braque du Bourbannais Breeders who have Braque du Bourbannais puppies for sale.